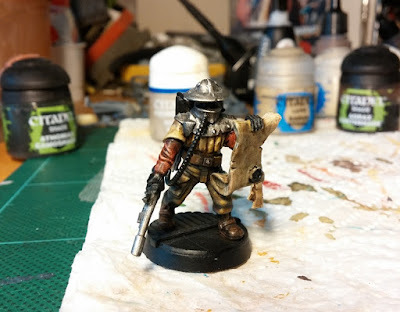 Further spurred by all the Inq28/Inquisimunda goodness at The Ammobunker - I have found grounds to finish of the very first Inq28 model I ever made. I actually still think he looks pretty cool, however I'm quite happy to upgrade the painting some. Looks great man, really dig the use of bits, and the paint scheme is bang on. Good stuff! Totally get the feeling he's got a Writ of Execution there, and is just about to fulfill the terms.